When I reviewed Majestic’s album Descension in the summer of 2009, my words reflected my lack of enthusiasm for what I saw as yet another ‘solo pilot’ project by a very skilled multi-istrumentalist (Jeff Hamel, formerly of prog-metal band Osmium), ambitious yet lacking in direction. Things took a definite turn for the better with their following album Arrival – the first recorded with the participation of vocalist Jessica Rasche – though I still expressed some reservations about the compositional aspect. Rasche’s arrival (pardon the pun), however, brought some welcome depth and intensity to Hamel’s lengthy, sometimes rambling compositions, and the added bonus of one of the best female voices heard on CD in the past few years. With Ataraxia (a philosophical concept meaning ‘freedom from worry’ in Greek) it would not be overstating the case to speak about a quantum leap for the Minneapolis-based outfit – now become a real band, with Rasche’s husband Chris Nathe on drums. With the collaboration of a few guests (including Gregg Johns, Hamel’s partner in Proximal Distance, and leader of Mississippi-based project Slychosis), though resting mainly on Hamel’s talents as a multi-instrumentalist, Majestic have produced an album that is unabashedly ambitious – almost 80 minutes long, offering a wide range of sounds and styles that had already been foreshadowed in the band’s previous efforts, though not as coherently developed. The evident progressive metal bent of Arrival is here kept to a minimum, while the symphonic component emerges with far more authority. Indeed, Majestic seem to have grown out of that fascination with prog-metal that, in my view, caused Arrival to be not as impressive as it might have been. This time, Majestic decidedly head for more traditional prog territories, with most of the compositions bridging the gap between Pink Floyd-style spacey moods and symphonic textures, solemn and pastoral in turn. The longer, weightier compositions (between 7 and 12 minutes) are interspersed by shorter, more accessible numbers that prevent the album from turning into too onerous a listen on account of its length. Most important, though, the music on Ataraxia keeps melody at the forefront, all the while avoiding any descents into cheesiness. As a matter of fact, the danger of sounding too close to those terminally cheesy, female-fronted symphonic metal bands (whose progressive quotient is often rather flimsy) is thankfully kept at bay by Jessica Rasche’s stunning performance. Her clear yet assertive voice steers clear of the operatic excesses of so many female singers, relying on a near-perfect balance between sweetness and power. All but two of the tracks on Ataraxia feature vocals – mostly Jessica’s, though Jeff Hamel makes a brief appearance on the last two tracks. Touches of Genesis circa Wind and Wuthering surface in the cascading finale of the wistful, melodious opener “Disarray”; while following number “Faceless” begins very much in the prog-metal vein displayed on Majestic’s previous recording effort, then subsiding in favour of a fuller, more symphonic mood with plenty of tempo changes to add interest. The longest track on the album, the 14-minute “Take My Breath Away”, takes instead a more stately direction, with solemn, march-like passages and a lovely, nostalgic mood, enhanced by Jessica’s pure, heartfelt tones and Hamel’s clear, Gilmourian guitar. Another highlight, “Wither displays all of Jessica’s vocal versatility, with a darker mood and a sense of tension that contrast with the almost pastoral quality of “Faceless“, and more of Hamel’s excellent guitar work. As wonderful as Rasche’s vocals are, the two instrumentals can easily be numbered among the album’s highlights. The hard-edged riffing and overall ‘metallic’ touches in “Astral Dream” are never overdone, and do not overwhelm the spacey atmosphere created by the synths and the clear, piercing tone of the guitar; while the aptly-titled “Dance of the Elders” reveals a folksy inspiration in its lilting pace and a classical feel in the guitar parts, as well as reminiscences of the likes of Vangelis or Tangerine Dream in the haunting keyboard passages. As to the shorter tracks, the piano-led, funky workout of “Star Bound” allows Jessica to pay homage to her idol Ann Wilson of Heart, and the equally dynamic “Delusion” reveals a distinct influence of Pink Floyd circa Dark Side of the Moon, with a final section where Jessica’s vocalizing made me think of Clare Torry in the immortal “The Great Gig in the Sky”; while “Numb” and “Reflections” are both subdued, romantic ballads which, in my opinion, do not add a lot to the album – the latter providing a rather anticlimactic, though soothing, conclusion. 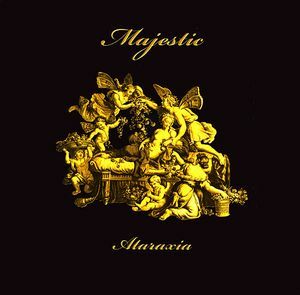 While Majestic do not pretend to be reinventing the wheel, Ataraxia is a classy offering, showcasing the work of a band brimming with an enthusiasm and love of their craft that have become increasingly rare in the music world, and whose compositional skills are growing by leaps and bounds. Though, as my faithful readers know, I tend to be rather critical of albums that exceed one hour in length, and believe that Ataraxia would have benefited from a bit of trimming, its refreshing lack of pomposity and ‘cheese factor’ balance its undeniable ambitiousness. Moreover, Jessica Rasche’s delightful vocals alone are worth the price of admission – she is a real find, and living proof of how a female singer does not need to indulge in operatic or cloyingly sweet excesses to offer a credible performance in a prog context. Hey send me an email will ya? where did you go on Facebook?